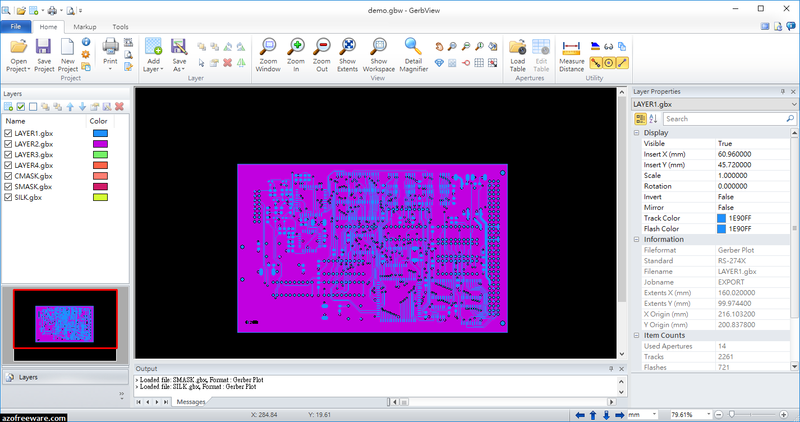 GerbView is a program that lets you view Gerber, HPGL/2 and Excellon files produced by most PCB CAD Programs. In addition, You can also view graphic file formats like BMP,TIFF,JPEG etc. - View, print, markup and convert Gerber, Adobe PDF, Excellon, HPGL and HPGL/2. - Convert Gerber, Excellon and HPGL/2 files to AutoDesk DXF, Adobe PDF and other formats. - Convert from RS-274D to RS-274X, known as extended Gerber format. - Convert multiple Gerber files to a multi-layer PDF, DWF or DXF file. Read more about creating layered PDF files here. - Convert your PDF files to Gerber RS-274X, HPGL/2 or DXF. - Add markup using lines, text, rectangles, images, QR-codes, barcodes, symbols, polygons and more. - Markup burn-in feature for converting markup elements to Gerber data. - Delete a selection of items from a loaded Gerber file. - Command line conversion and printing available. - Query for entity information in Gerber, HPGL/2 and Excellon files. - Measure distances, areas and perimeters, with our without snapping to pads and tracks. - Both metric and imperial coordinates supported. - Support for absolute or relative coordinates. - Highlight selected apertures in Gerber files. - Add files of different formats to a single workspace. - No limit for number of files within a workspace (only limited by memory). - Visibility of all loaded files can be set individually. - Rotate loaded files by any angle. - Copy selected region to clipboard, and paste into another Windows application. - Use mouse-wheel for zooming and panning operations. - Ortho mode for fast drawing of horizontal and vertical markup lines. - User defined header and footer for printing. - Color or Black & White Printing. - Full mode print preview. - Poster mode for printing big format drawings on e.g. multiple A4 pages. - TIFF, CALS, BMP, PNG and JPEG files can be added to a Workspace (for logos etc.). - TIFF, CALS, Adobe PDF, Windows BMP, PNG and JPEG.